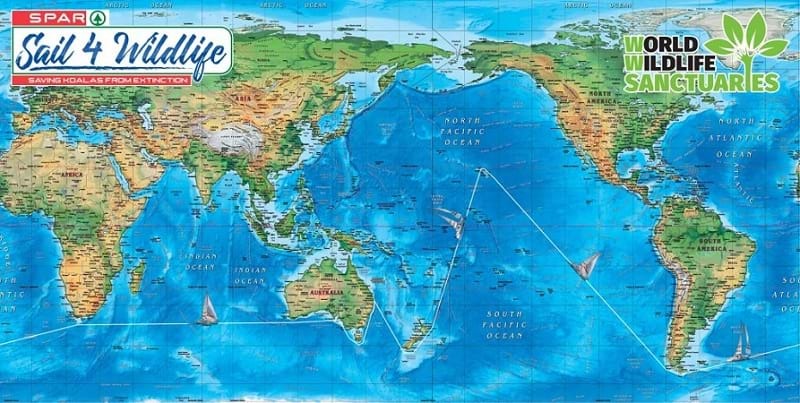 Four years and 55,000 nautical miles of open ocean is what awaits Peter Steele, as the Gold Coast sailor prepares to embark on the voyage of a lifetime. And he's doing it all for koala conservation. The 82-year-old is setting sail on Thursday to circumnavigate Australia, returning to the Gold Coast before heading east to travel across the globe. He will be 86-years-old when he expects to return, breaking more than a dozen records in the process. "I don't believe anyone has either circumnavigated Australia or the world at that age," said Mr Steele. "There will be a number of other records ... about 16 in total." The funds raised will go towards paying off 411 acres of land at Kyogle in northern New South Wales, bought by Mr Steele's not-for-profit organisation World Wildlife Sanctuaries. It was purchased with the hope of being converted into a sanctuary for koalas and other endangered species. Despite his age and the massive distance ahead of him, Peter admitted he wasn't feeling nervous about the two journeys. "Not any nerves really," said Mr Steele. "It's a situation of having to play it by ear, and face whatever comes up when it happens. Peter will be updating a blog about his voyage on the World Wildlife Sanctuaries Facebook page for anyone looking to keep up. The organisation is also always looking for new members and volunteers to help local wildlife. For more information about the planned journey head to the Sailing 4 Wildlife website.